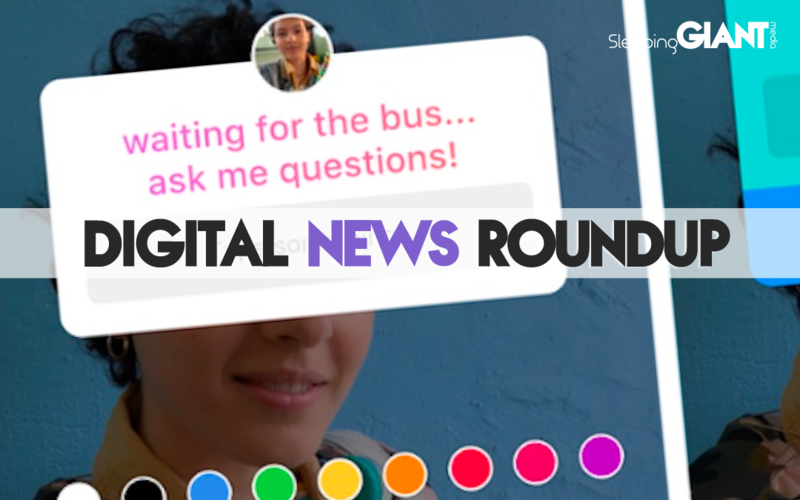 Another week bites the dust, which means it’s time for another roundup of the week’s top digital news. This time it’s all about WhatsApp’s new labels, Facebook facing fines, the rollout of Google’s new URL inspection tool, and the Instagram feature that’s probably been plaguing your Stories in the last few days. If you’ve been on Instagram at all in the last few days, then you’re probably already aware of its new feature – questions. The new questions sticker allows other users to submit questions to you through a Story, which you can then answer in a subsequent post. You can find the new feature in the sticker drawer, the same way that you add GIFs, polls or locations. Responses then appear in the list of people that view the Story, which is accessed by clicking in the bottom left corner of the post. Instagram has been quoted as saying that the new addition is “a way to start conversations during moments when you don’t necessarily have a photo or video to share” – although some feel this just means a way to keep posting even when you really have nothing interesting to say. Take a less sceptical view, and there are tons of ways that you can use this new feature to your advantage. 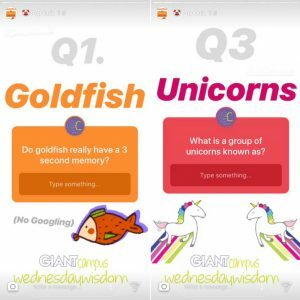 Our sister company, Giant Campus, used the questions to run a pop quiz on their profile this week – head over there to check it out and test yourself! Or read more about the new feature at The Verge. Google Search Console whizz-kids will have heard about the release of a new URL inspection tool just over two weeks ago, and now Google has announced that everyone will finally be able to access it. 15 days after first releasing the tool, all users are now able to access the feature within the new Google Search Console. It allows you to run checks on a specific URL and see how it’s viewed in Google search. Information such as the last crawl date, the canonical URL and any indexing or crawling errors can all be viewed, as well as any AMP errors or whether or not the page has been successfully indexed. Search Engine Land has the full story, or head to the Google Webmasters Support blog for more information about how to use the tool yourself. It’s beginning to look a lot like…Christmas? Well, not quite, but digital mega brands are already starting to plan their festive strategies – which is why Facebook is getting ahead of the curve and launching its new range of retail tools, tailor-made for festive shoppers. According to stats in a blog on the company site, “each year, nearly half of consumers begin their holiday shopping before the end of October”. Because of this, Facebook is launching new features ahead of the winter season which are designed to help brands engage with mobile customers, and give them the best possible shopping experience online. Some of the new tools include things like a Video Creation Kit for making short product videos, as well as news that Instagram’s shopping in Stories feature will be rolled out to all brands that have shopping enabled over the festive season. One of our favourites, however, is the AR ads – which could mean that people can interact with product ads in a whole new way. Michael Kors was the first to try the feature, allowing customers to try on different sunglasses through the tech – with names like Sephora and NYX set to roll out their own tests soon. In-built CTA’s within the AR ads will mean people are just one click away from making a purchase, making this ad option both cool and clever. Nice one Facebook. Check out more on the official announcement blog, or read The Drum’s take. Experts say the update is the latest in a host of new features designed to tackle the platform’s fake news problem – after use of the app has been linked to “enabling the spread of dangerous viral rumours”. Two countries where the new feature was beta tested, India and Brazil, have seen particular issues with fake news and rumours on the app – including resurgence of the yellow fever disease and rumours of child abductions. The new label, which shows when content has been forwarded from one user to another, will work for all messages – including text, image and video. According to a blog on the WhatsApp site, it will help people to know where a message originally came from – and make conversations easier to follow. For more on the story, head over to The Verge. You may be aware that we’ve talked an awful lot about Facebook this year – particularly following the Cambridge Analytica scandal. And it appears that particular drama is still far from over. This week media outlets began reporting that Facebook has now been handed the maximum fine possible in the UK by the information commissioner for two breaches of the Data Protection Act, relating back to its involvement in the Cambridge Analytica scandal. Stating a failure to safeguard user data, and a lack of transparency on how user data was being used, Facebook will be docked £500,000 – and although this may sound substantial, The Drum reports that the social network makes this much in revenue every five and a half minutes. Yep. This comes as news that Facebook’s stock valuation has hit a new all-time high, showing that the ripples of the past six months have done little to dull the site’s popularity. Check out the rest of the details at The Drum. Time to enjoy the weekend, people! Less than a week till our next #GIANTtalks – Become a Content Marketing Superhero. Book your free place today.